Trump has repeatedly said that as president he would institute aggressive measures to limit immigration of Muslims into the country and to place Muslims currently within the United States’ borders under close scrutiny. He has promised to halt the entry of Syrian refugees and to also ban immigration from a number of countries -- including Pakistan and the Philippines -- with large Muslim populations. He is quoted as suggesting the creation of a national database of Muslim and Muslim Americans -- a proposal that is likely unconstitutional -- and he staffed his White House transition team with Kansas Secretary of State Kris Kobach, the architect of the highly controversial NSEERS registry system which was used to monitor the movement of Muslim immigrants under George W. Bush and the first half of the Obama administration. 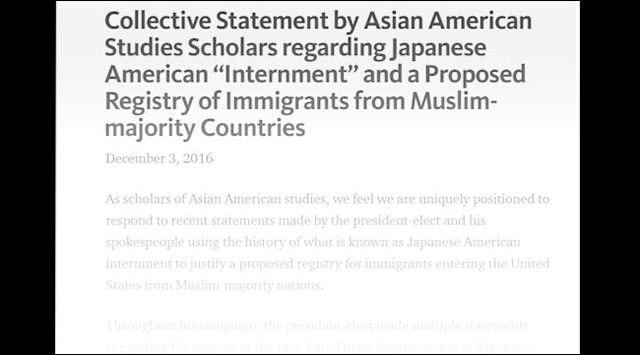 As scholars of Asian American studies, we feel we are uniquely positioned to respond to recent statements made by the president-elect and his spokespeople using the history of what is known as Japanese American internment to justify a proposed registry for immigrants entering the United States from Muslim-majority nations. ...Such statements willfully disregard decades of knowledge about so-called "internment," ranging from the vast body of historical scholarship and educational materials produced on the subject to the achievements of the redress movement as consecrated in the 1988 Civil Liberties Act, passed by a bipartisan Congress and signed by President Ronald Reagan. This legislation, which formally apologized to imprisoned Japanese Americans, unequivocally states: "The internment of the individuals of Japanese ancestry was caused by racial prejudice, war hysteria, and a failure of political leadership." The legislation implicitly acknowledges that the government, through its policy of mass imprisonment, facilitated and sanctioned anti-Asian discrimination and violence throughout the country. Alarmingly, calls for a Muslim registry now both draw upon and indirectly condone the rise of Islamophobia, xenophobia, and racism in recent months. That the president-elect promises to "make America great" by institutionalizing thinly veiled racist policies and practices assaults our principles and values. Alongside Black Lives Matter, DREAMers, #NoDAPL, and other social justice movements, we cannot stand for policies or rhetoric that threaten any of our communities. We understand the legacy of so-called internment as a guiding light of what not to do for our present and future. We fear the long term implications of any list based on race or religion. The proposed policy of a Muslim registry lays a dangerous ground for the violation of civil liberties that may or may not include mass imprisonment. We reject using Japanese American mass imprisonment to justify the targeting of Muslim people. Statement co-organizer, Vivian Shaw (@vgshaw) -- a doctoral candidate in Sociology at the University of Texas at Austin whose work focuses on race, hate speech and social movements in Japan -- believes that Trump’s election is a clarion call for ethnic studies scholars and intellectuals to further engage in the public discourse. "As scholars, I think our role in politics resides not only in working directly with policy-makers but in creating and sharing knowledge," says Shaw. "In this vein, it’s of crucial importance for scholars to continually strive to "bridge the gap" and put critical concepts into common language. Asian American Studies scholars, in my opinion, are well-disposed to take up this task because social justice, solidarity, and an awareness of the transnational ramifications of "domestic" politics have always been central to our intellectual history." Shaw points out that Trump’s attacks on the Muslim American community also represent an assault on the Asian American community. Not only is the Asian American community diverse and inclusive of many Muslim, Black, Latinx, and indigenous members, but as Asian American Studies scholars and activists, our work is also necessarily intersectional and coalitional. "Asian American studies is constantly in exchange with gender studies, black studies, Latinx and Latin American studies, indigenous studies," says Shaw. "Historically, we have seen coalition-building at various points throughout the twentieth century and more recently, efforts such as AAPI’s solidarity with #BlackLivesMatter." When it comes to the Trump team’s ahistorical misreading of Japanese American incarceration, it is particularly incumbent upon the Asian American community to speak up and to set the record straight. "The decades of research on Japanese American exclusion and incarceration not only teach us about the depth of suffering that was "justified" under Executive Order 9066," says Shaw. "[It also teaches us] how xenophobia and racism can create a direct pathway for governments to change the rules of our civil liberties." "We cannot be silent in the face of injustice," says Shaw.